The distance between two holes feature or between a hole feature and other features must not less than the diameter of the holes. See below figure, meanwhile, the thickness of the hole should be as bigger as possible otherwise it would be easily broken. When it comes to a threaded holes, the design becomes very complex, inner stress will be easily generated around the threaded area, which make the plastic parts fragile, usually, distance between hole feature to the edge of the part must 3 times bigger than the diameter of the hole. By the view of parts assembly, design of through holes are employed much more frequently than blind holes; plus, through holes are much easier to produce, by the view of mold design, through holes take advantage as well in construction, to mold a holes feature, common mold design is making one insert pin fixed and hold by both ends of the mold or two insert pins fixed and held by each end of the mold. Blind holes are created by insert cores; it can only be fixed and held at one end, which means it could be possible to be forced to deform under strong meld flow force, it becomes oval shape when deformation occurs, so the length of insert cores should be as less as possible to avoid the deformation happening, usually the deepness of the blind hole pins should be not exceed twice of the diameter of the blind holes. 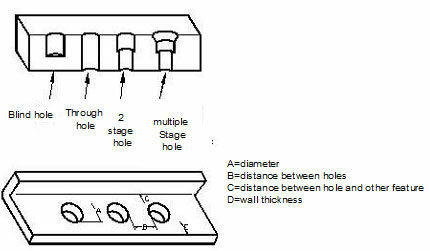 Holes on the side will increase the complexity of mold design, the undercut is created when the direction of the holes is not in the direction of de-molding, a slider or cylinder is required to be employed to release the hole feature, the mold size and complexity of manufacturing increase massively, injection mold cycle time would be longer because of additional mechanisms action, so the total cost of molding blind holes design is much higher. Multiple stage with diverse diameter holes. Holes with multiple stage allow longer length of the hole pin. Holes on the side would require sliders or cylinders, complex mold structure and additional accessories mean much higher cost, to avoid the undercut, designer should consider the angle of the wall of the side holes, or employed 2 stages hole to replace original design. Leave a 0. 4mm tap will be an economical and realistic way for manufacturing.